Who doesn’t love a decorative and delicious Christmas cookie! One of my favorites is Easy Classic Holiday Spritz Cookies! 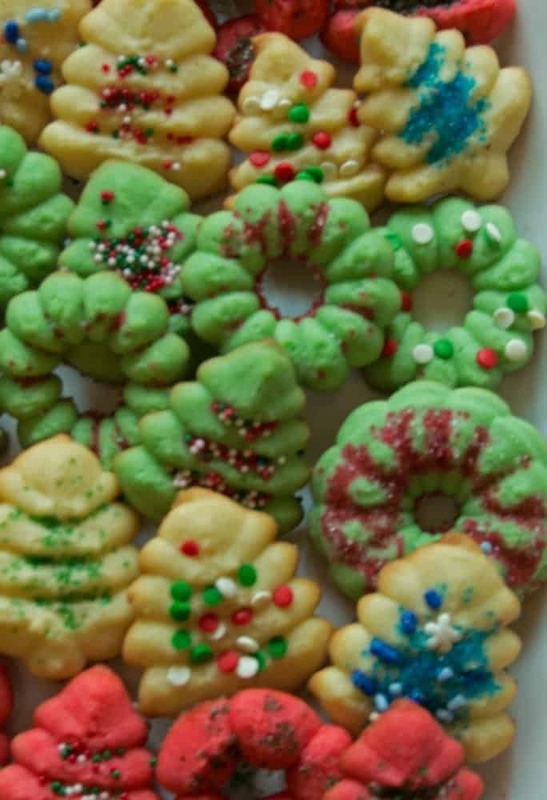 These are so festive and a great cookie to have the kids help decorate! I really do love any Holiday celebration! Christmas is a favorite! Baking for Christmas is a family tradition! This is one area where I really don’t worry too much about calories. I do make some lower fat cookies! Generally, I bake our favorites and advocate moderation and exercise! This cookie is the bomb..but I don’t eat all 50 cookies! Okay, I could, but I don’t! Share these Classic Holiday Spritz Cookies with family and friends! You will receive lots of hugs!! 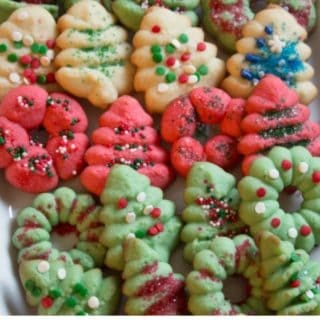 I love a great Holiday cookie!My family does not eat a lot of sweets so when we indulge, we love a great sweet! These Holiday Spritz Cookies are so buttery and festive! I have been making this recipe since I was a child! I was given a cookie press and the rest is history! I make Holiday Spritz Cookies for all Holidays! The fun is in separating the dough into groups. I use food coloring to color the dough. Obviously for Christmas, I use red and green food coloring! Then a batch without any coloring! We decorate them and its a blast! If you do not already have a cookie press, get one! They are easy to use and I am telling you,this cookie recipe is the best! Just ask my family and friends…they love these babies! If you are looking for a few great Holiday cookie recipes, try my Rugelach! If you haven’t already, that cookie is a must make too! 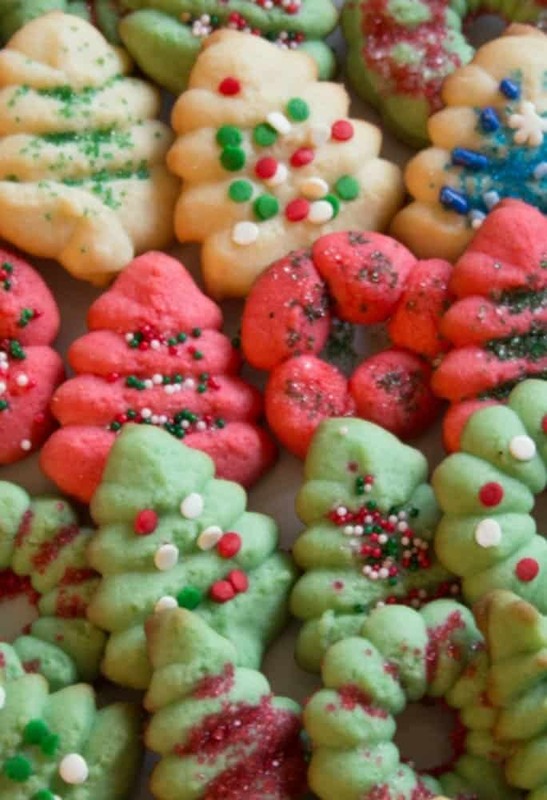 What are your Holiday cookie traditions and what are your favorite recipes? I hope you like this recipe as much as my family! Please share the love on Facebook, Pinterest, or your favorite way of relating to your friends and family, and please continue connecting with me on Instagram, Pinterest, Twitter, Bloglovin, Google Plus ! Feel free to subscribe to my newsletter to never miss a recipe! When you make one of my recipes, tag #everydayeileen on Instagram, so I can share with others! A buttery Holiday cookie that can be colored for seasonal decorating. We make dozens for Christmas and share with family and friends! You do need a cookie press to make these cookies! A wonderful kitchen tool! In mixing bowl, combine butter and sugar. Blend well. Add in egg and vanilla to combine well. Gently stir in the flour and salt. At this point, divide dough into equal portions. Depending on the Holiday, use food coloring to color match the Holiday. For Christmas, I use green, red, and leave a portion plain and I use Holiday spritz cut-outs. Fill the cookie press according to manufacturers instructions. Use desired shapes and press on an ungreased cookie sheet. Decorate with your colored sugars and sprinkles. Bake until set. I have never gone past 6 minutes. Move cookies to cooking rack to cool. Can be frozen for about 1 month. use food coloring or gel to color the cookie dough to your color preference. Nutritional value is estimated as ingredients and size of portions can vary. That is fabulous Milly. I am so glad you made Easter cookies with the spritz cookie recipe. Happy they were a hit.